75A idle current and a 12.5mW/sr transmit intensity. VISHAY Intertechnology, represented in Australia by Braemac , has released two IrDA serial infrared (SIR) transceivers. The TFBS4650 and TFBS4652 measure 1.6 mm x 6.8mm x 2.8mm. Used as drop-in replacements for the HSDL3208 and HSDL3209, the transceivers offer a 75A idle current and a 12.5mW/sr transmit intensity. They are aimed at data transfer applications in mobile phones, camera phones, smart phones, and PDAs. 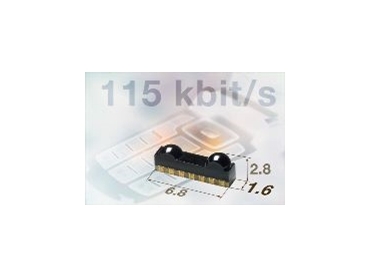 They enable longer on-axis transmit distances with lower power consumption. The TFBS4650 and TFBS4652 also enable mobile phones and PDAs to function as universal remote controls for televisions, DVD players and recorders, and other home appliances over a range of 5.5m. The operating voltage range is from 2.4V to 3.6V. The TFBS4650 I/O voltage is dependent on the voltage of the external power supply. The TFBS4652 I/O voltage can be as low as 1.5V, allowing direct connection to a microcontrollers’ I/Os with 1.5V or lower logic. Integrated EMI protection eliminates the need for an external shield. Both devices are lead-free and capable of lead-free processing, as well as being fully compliant with the European Union’s RoHS 2002/95/EC and WEEE 2002/96/EC environmental directives. The transceivers are also compliant with IrDA Physical Layer and IEC60825-1 Class 1 eye safety specifications.